We’ve been doing Island Expeditions wrong this whole time — or at least since Blizzard increased the chance at rewards recently. Wowhead and Reddit user Flak_Knight have unearthed some interesting details that have led to theories about how the Island Expedition rewards work. Essentially, what you do while you’re traversing the islands (seemingly) has a direct impact on what kind of loot you’ll receive at the end. Players’ current method of completing Expeditions — hitting the Azerite cap as fast as possible — can prevent you from the rare rewards. That means that running around trying to finish the scenario as quickly as possible is not the best method unless you don’t care about the bonus loot. Remember: There’s a pretty bird mount on the line here. Stop mining Azerite and start looking for rare, named enemies to kill. If you kill them, according to many reports backed by Wowhead and others, their loot tables will become available for when you finish the island. This is all speculative and is still being tested, but there are enough people saying this is how it works that it seems to be true. The examples Wowhead gives include stuff like a pirate-themed item only dropping if you kill a named pirate enemy. If you skip the rare spawns and the random events, you’ll give up your chance at that special loot. It’s also unclear if the island difficulty setting affects the chance at receiving the loot. Clearly more testing needs to be done, but it seems like finding a balance between exploring for rares and gathering Azerite is the way to go here — good luck coordinating with your two random teammates, though. It’d be nice if this information was somewhat clarified by Blizzard or the game itself, but it doesn’t seem like providing any indication of how Island Expeditions work was intended. Instead, it appears to be more about the fun of exploring and gaining what would otherwise seem like random loot. The problem is that players will almost always want to minimize time spent and maximize the rewards. 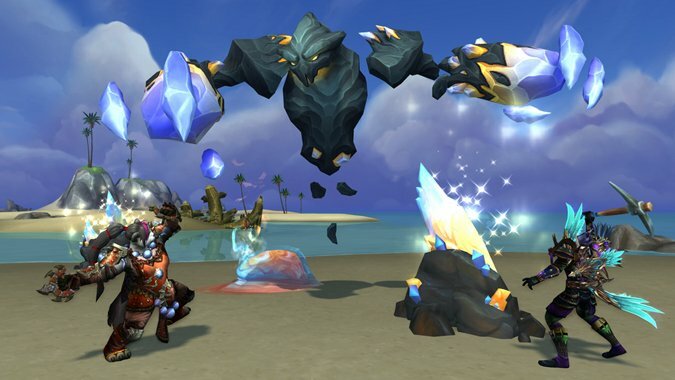 What’s your experience in Island Expeditions, and what do you think about this reward system?